List of the biggest baddest pro bike races in the world! This year, the list of UCI WorldTour races is long and familiar, all races remain the same as in 2014, except the Tour of Beijing which is no longer part of the UCI WorldTour. The names are the same, but most of the routes differ year to year. For the next few months your Sundays will be busy. This weekend Paris-Nice begins! It is promised to be big. Who will be there - all the usual main season suspects: Carlos Betancur, Romain Bardet, Tejay van Garderen, Fabio Aru, Michal Kwiatkowski, Tom Dumoulin, Richie Porte, Gerraint Thomas, Michael Matthews, John Degenkolb, Alexander Kristoff, and Bradley Wiggins (in a supporting role). We can watch the Paris-Nice race Live starting at 14:00 CET (5:00am. EDT, 7:00am MDT), simply check in for links at Steephill.TV or CyclingFans. And then do the same for all the other races listed below. 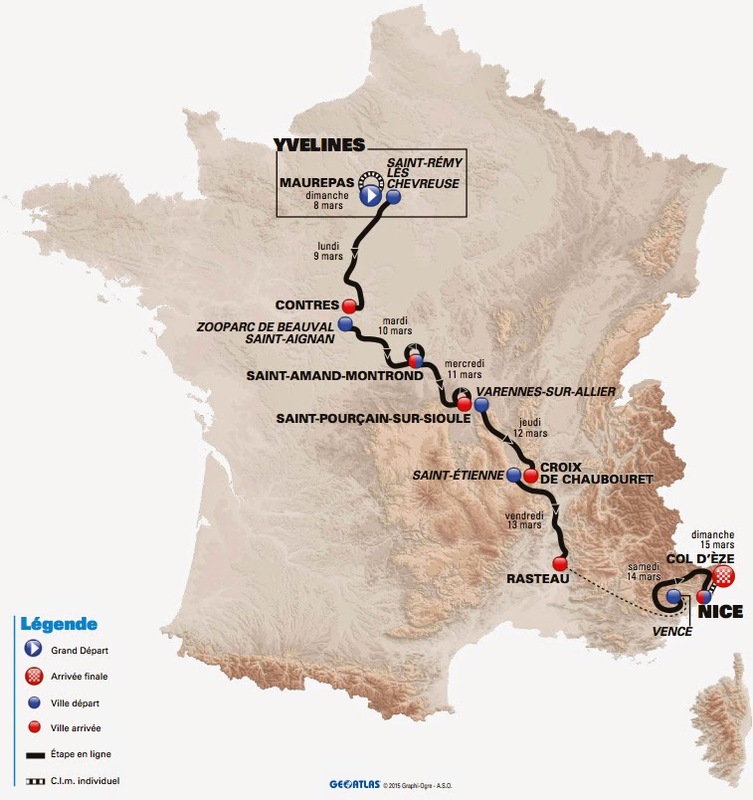 Official website route description: The 73rd edition of Paris-Nice will set out from Maurepas in the Yvelines district on Sunday after a series of events dedicated to cycling on Saturday. The race will then begin its southbound journey towards its first ever date with the col de la Croix de Chaubouret near Saint Etienne. The action will be beamed to 170 countries across the globe. CyclingNews route description: RCS Sport published the route map and profile of the 293km route on Friday, confirming that no extra climb will be added to tip the race in the favour of the climbers. 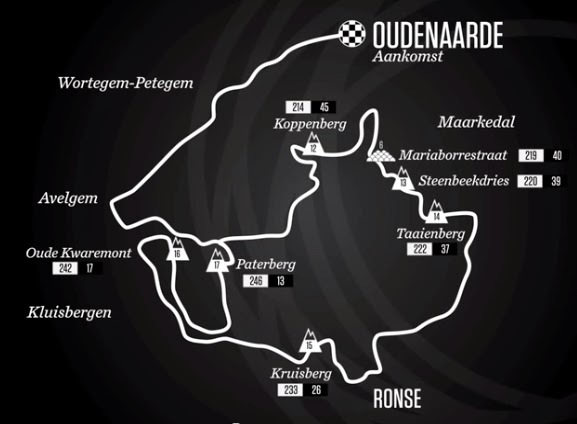 RCS Sport was hit by a backlash of criticism by riders and fans who made it clear they preferred the finely balanced traditional race route. Via Roma will again host the likely sprint finish after a seven-year absence. 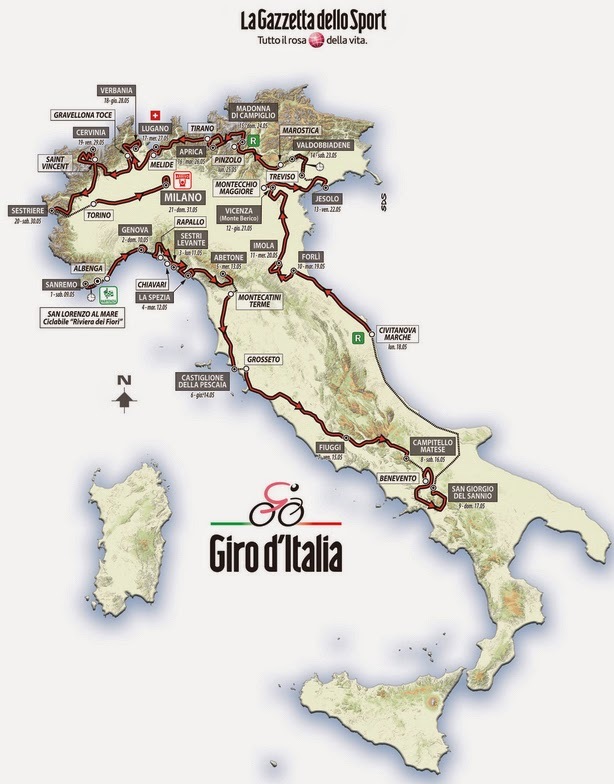 Official website route start description: The 2015 Giro d’Italia will kick off on the 9th of May, with an 18km team time trial along the coast between San Lorenzo al Mare to San Remo. 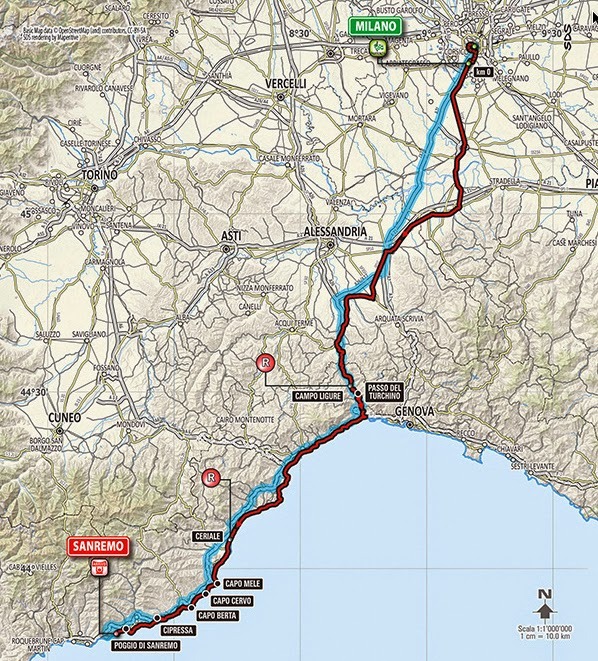 The 98th edition of the Corsa Rosa will run over 21 stages to the 31st of May and the organisers, RCS Sport/La Gazzetta dello Sport, have announced all three opening stages will take place in the picturesque region of Liguria, which sits on the Italian Riviera. 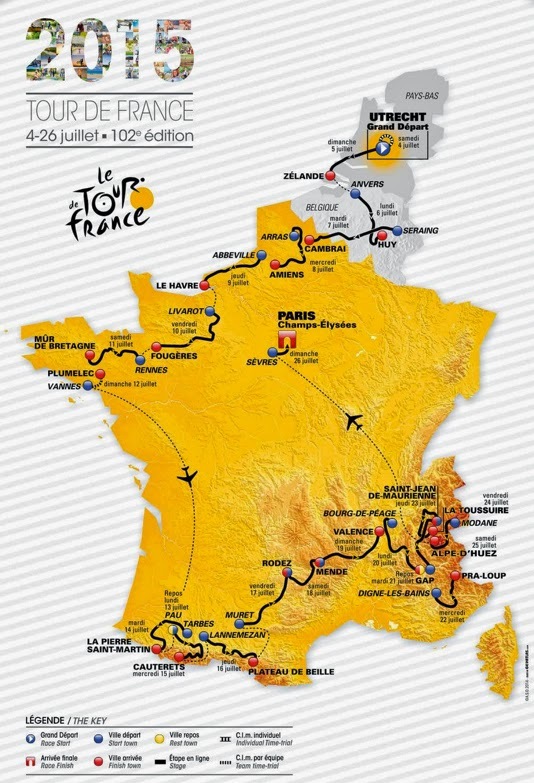 Official website route description: Running from Saturday July 4th to Sunday July 26th 2015, the 102th Tour de France will be made up of 21 stages and will cover a total distance of 3,344 kilometres (before ratification). This 21st Grand Départ from abroad will also be the 6th from the Netherlands which is a record. The Tour will then spend two days in Belgium before reaching France. Read more, Pedal Dancer: Route of the 2015 Tour de France announced. 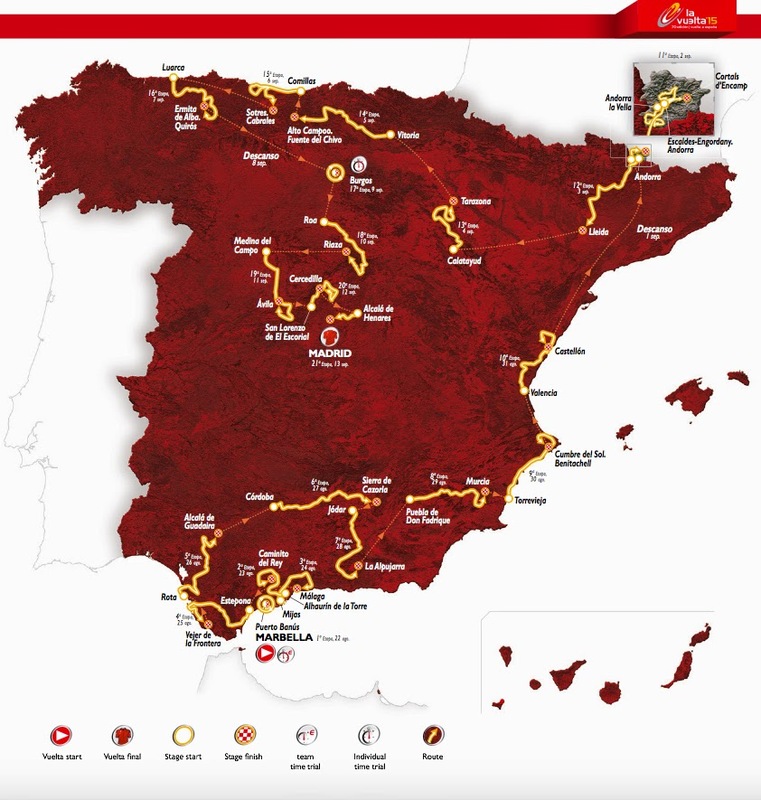 Official website route description: Running from Saturday August 22nd to Sunday September 13th 2015, the Vuelta will be made up of 21 stages and will cover a total distance of 3,374.4 kilometres. The first four stages will take place on Malaga territory. Who won the WorldTour Races in 2014? Looking at who won the key races last year, will quickly tell you the type of rider that will likely win in 2015. It is clear the same riders do not always win, but Gerrans, Valverde, Contador, and Kristoff were all in the news a lot in 2015. Alejandro Valverde easily won the most overall points for the 2014 WorldTour.